Enjoy nature in Cordoba. Senderos Cordoba (Cordoba Hiking Trails) invites you to visit the Bejarano Stream, a charming, unique landscape dotted with numerous historical remains and a key area to further our understanding of the splendour of Roman Cordoba and the Caliphate city when it was ruled from the Madinat Al-Zhara palace. It is a 12 km hiking trail, ideal for beginners, which takes 5-6 hours. 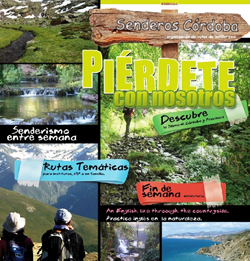 If you are looking for other trails, Senderos Cordoba has a wide range on offer in Cordoba and around the province: Trenches of the Civil War, GR 48 Hiking Trail, Mozarabic Trail, The Subbetica Mountians, The Sierra Morena Mountains and many more. -Private hiking guide service (minimum 4 persons): 15 euros per person. -Special deals for groups and discounts if you join in organized activities with people from Cordoba.